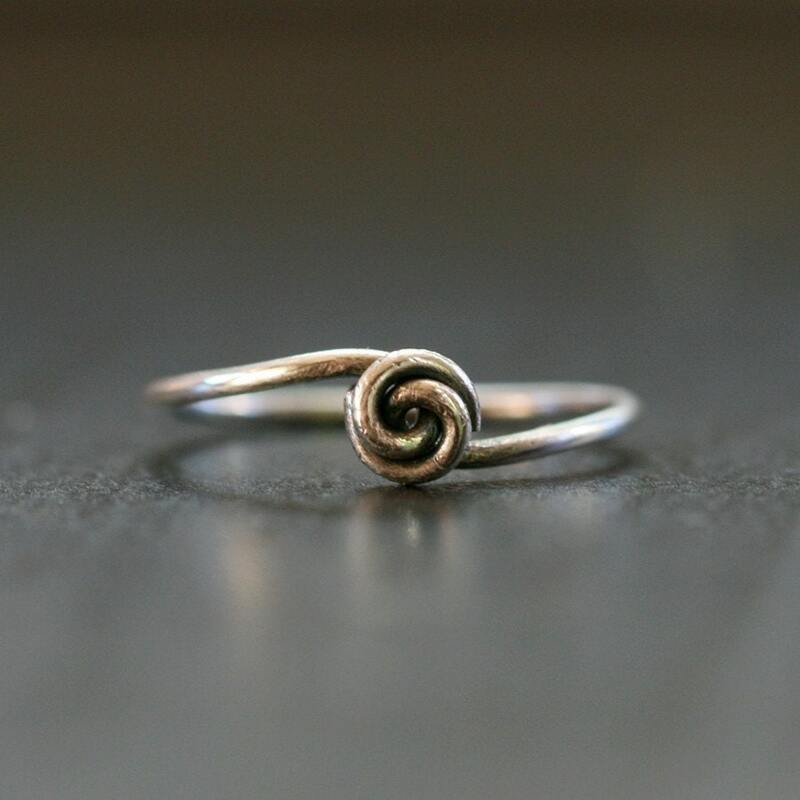 You can make this lovely ring (or a version of this design) yourself, using just some basic tools, wire and a lip balm! Yes, in this tutorial I am going to demonstrate that just basic beginner tools and a wire from Michael’s can go a long way! Wouldn’t this ring make a great present?? PLEASE excuse the state of my nails in these pictures..
First thing to do is to cut a piece of wire. Next, wrap your wire around the tube of your lip balm. Wrap it on tight and slip it off. Now bend the wire coming from your left to aim away from the ring and then bend again to aim it slightly upwards, as shown on pictures below. With your round nose pliers form a little ‘almost loop’, wire crossing above itself on the top side of the ring but not actually touching. Now you are going to put the other size of the ring (the wire from the other side) through the loop that you almost created. Ideally, you have left a little space between the ring the wire crossing itself (hence forming the loop) and so you can slip the other wire in very easily. If you can’t do it that way, just get it in any way you can and then ‘reform’ the ring shape again using the lip balm tube. Now you can ‘close up’ the first loop a bit (bring the wire closer to the ring) and do the same with the send wire end, forming another loop, as indicated in the picture below. Almost done! The hardest part is done. Just make sure, before you close up the knot, that the ring is the desired size. You can still make it slightly larger or smaller at this point. Once you close your knot, the ring is basically done. Use your chain nose and bent chain nose pliers to close up the knot, shape it the way you want it, and adjust the wire ends to a place where they are not visible and where they don’t irritate the skin. Once you adjust the ends, you can use a nail file to file off any sharp edges and blemishes. To buy this sterling silver ring from Elephantine’s shop, click on the picture. If you find that your fingers do require some fuss, but you don’t have the tools, time or patience, a talented jewelry artist sells rings of this design in her shop Elephantine on Etsy. Her rings, however, are made of quality sterling silver and look very professional. Very cute. And easy-to-follow instructions, too. Wonderful, I think I could manage this. Off to make a ring! I like it – can’t wait to try it. Thanks for sharing. I have a little love knot ring that my mother gave me, long ago, that is very similar to this. It’s gold & welded, but the end result is not much different. Maybe I’ll turn it into a set of stacking rings. Thanks for the tutorial! This is amazing! And it’s something that I can actually do! I played with it a bit, so it isnt the exact same- but I loved your tutorial! Thanks! I loved the tutorial but after making the second loop I got kinda lost. Any advice? Each one I make sort of comes out different but I’ll get the hang of it. Makes a nice stackable ring. I saw this a few months ago and wanted to make it but I didn’t have the materials or anyone to give the ring to. I found someone who would accept a ring and got the materials last night. I didn’t bother to look at the instructions again because I had the basic idea, but I had too much trouble getting the wire to wrap around the chapstick. I ended up using extra wire and wrapping two pieces around each other. It looks great. This would be perfect for my granddaughters! Thank you! What an adorable ring! And you did a marvelous job of that tutorial…it’s better than those in many jewelry-making books I’ve seen. Thank you so much for sharing! Lovely! I’m not normally one for tutorials, but this is so nice, simple, and fun. I think I’ll have to try it myself! I am going to try this It looks easy enough even though the knotting part might be more difficult. Buy more wire to make up for the first few imperfect ones. Thanks for this! What a simple sweet ring think I’m going to try it. Thanks for sharing. Very pretty! Only, I cant figure out how to make it wrap around! Maybe make your directions a little simpler for us begginers! But over all, very simple and elegant! Love it! I just can’t seem to get the second part to loop correctly. I’ve got a few attempts where I’ve been able to get a little cluster of wire, but none are as symmetrical as yours. Would you consider posting a close-up video on youtube or here? Love your tutorial so very much! Here’s my takes on the ring. i cannot wait to try this, the only bad thing is that i cannot see any of the pictures except the last one it would be a bit helpful to see and compare progress…. not sure what is happening there… try viewing the post in a other browser. I can’t see any of the pictures except for the last one, either. I’ve tried firefox and safari and no pictures. Pictures are back! Sorry about the technical difficulties! Wow! This is so elegant and simple, thanks for the tips. Okay, my ring doesn’t look much like the one pictured, but it’s still pretty darn cool. I think I’ll make a bunch more…what a fun tutorial! Thanks a bunch! The ring is pretty, but I seriously have no idea what’s going on this tutorial. More, better pictures would be helpful. A friend and I decided we were going to have a jewelry-making day and I brought the instructions to make this ring, along with all my supplies. I was so sure we could do it because I’ve made a few things before. It was the most fun we’ve ever had, but our rings certainly didn’t look like yours! They were hilarious! I’ll probably be ordering one from Elephantine. I really like the ring. Would you be able to post a new tutorial with bigger and step by step pictures or possibly a video. I have tried multiple times but the pictures are not easy enough to understand when the partial hoops begin. My rings look nothing like yours :(. Please follow up! Thank you! Just made one out of a paperclip! It took a few tries but your tutorial was so helpful!